The prototype has been created for Lost &amp; Found, a National Endowment for the Humanities funded game that aims to promote and enhance the public understanding of religion. A team of interdisciplinary researchers, designers and developers led by Owen Gottlieb, an assistant professor of interactive games and media at Rochester Institute of Technology, has created a digital prototype for Lost & Found, a strategy game that aims to promote and enhance the public understanding of religion. The project, funded by a $100,000 grant from the National Endowment for the Humanities, marks the first time a NEH award has been given to a professor in RIT’s B. Thomas Golisano College of Computing and Information Sciences. The prototype was even featured at the 50th Anniversary of the NEH, held this September at the University of Virginia. The “Lost and Found: Promoting Religious Literacies through Gaming” project focused on developing a digital game set in 12th century Egypt that teaches students about medieval religious legal codes. The purpose is to enhance people’s understanding of religion, improve discussion surrounding religious legal systems and increase awareness of their prosocial aspects, including collaboration and cooperation. The game prototype took nearly a year to create, with help from 16 graduate and undergraduate students, as well as faculty in RIT’s School of Interactive Games and Media (IGM) and the College of Imaging Arts and Sciences. Co-principal investigators for the game included Jessica Bayliss, associate professor in IGM who worked as the team technical advisor; David Simkins, assistant professor in IGM who oversaw evaluation on the game; Ian Schreiber, assistant professor in IGM who worked as the core game mechanics designer; and Kelly Murdoch-Kitt, assistant professor of graphic design who was the visual design director. Also contributing to the project were humanities consultants from Harvard Divinity School, Vanderbilt University, Nazareth College and others. 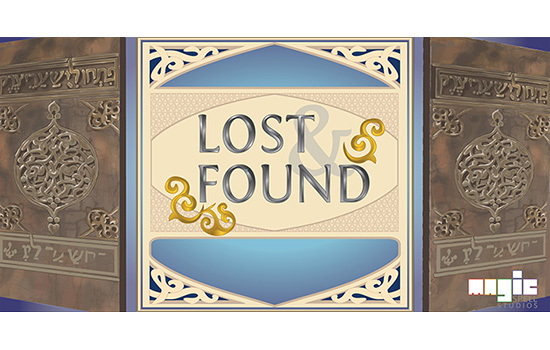 Prior to the grant, Lost & Found was originally created as a tabletop strategy card game, while the digitally animated prototype was designed for mobile phones and tablets. In the game, players take on the role of villagers who must balance personal needs with the needs of the community, all while navigating medieval religious sacred law systems. The game centers on laws that helped solve community problems and were handed down over hundreds and sometimes thousands of years of legal tradition. The initial model of the game teaches Maimonides’ Mishneh Torah, a medieval Jewish law code. In the future, the team plans to build out the game to incorporate Muslim and potentially other sacred law systems. “Games are essentially rule-based systems, so ancient legal structures are particularly suited to study through games,” said Gottlieb. The team continues to improve on the digital prototype and a version of the physical tabletop game, with the goal of producing both games and bringing them to market. Gottlieb sees the games as teaching tools for universities, high schools, libraries and museums. The project was developed in collaboration with the Golisano College and the Initiative in Religion, Culture & Policy @MAGIC, housed within RIT’s Center for Media, Arts, Games, Interaction and Creativity (MAGIC). Gottlieb is the founder and lead research faculty of the initiative, which cultivates new research focused on games, religious literacy, the acquisition of cultural practices and the implications on policy and politics. The NEH, an independent federal agency, funds high-quality projects in fields such as history, literature, philosophy and archaeology. To learn more about Gottlieb’s work, go to owengottlieb.org.